Every drop of LAODI Rum is sophisticated and is of the finest quality produced from the organic sugarcane from our own plantations. full strength of the sun’s rays which floods over our tropical country. The Distillery is cared for by local honest-hearted humble folk of Laos and receives the enlightened direction and support of Japanese vision and invention. This combination works together to successfully producethe fine natural handmade products of the LAODI Company. Fermented naturally, our signature White Rum has full-bodied taste with aroma of fruit. Straight or On the rock recommended. Aged with French oak, our Brown Rum has full-bodied taste and rich flavor. Imagine the Marriage of Fruit and Rum! LAODI fusion of friends is unique to LAODI and brings delight to the individual discerning palate of the connoisseur. Our White Rum meets with 5 different fruit from Laos, which delivers the unique and amazing rum experience. On the rock recommended. Plums grown on organic farms in the Xieng Khouang Province of Laos are fermented into this popular Plum Marriage Rum. This fresh crystal pink Rum is highly recommended. The combinations of mixes you can make is only limited by your imagination! Coconut Marriage can be mixed perfectly with pineapple, milk, yogurt, coke or other mixers to make your own delightful concoction. This sweet soft Rum is fermented from the pure sugarcane grown organically on our own LAODI plantations. Mix Sugarcane Marriage with soda, lime and fresh mint and throw over a few rocks of ice and enjoy with sweet cakes as an accompaniment!! Organically grown in the south of Laos in the Champassak Province, this sweet and sharp fusion has a rich aroma and distinctly reflects the independent spirit of the South of Lao. Good to mix with mango, pineapple and other fruits and can be thrown over chunks of ice. This finest Lao roasted coffee grown on the Bolavens plateau in the south of Laos has a rich flavor and will excite the discerning connoisseur’s taste buds. Mix with milk and drink on the rocks or just as is. The Marriage of three nations with the UME Japanese plum planted and harvested in the mountains of Chiang Mai in the north of Thailand at 1300 meters. sugarcane rum to make our very special UME Marriage Rum. Drink on the rocks,straight or mix with soda. 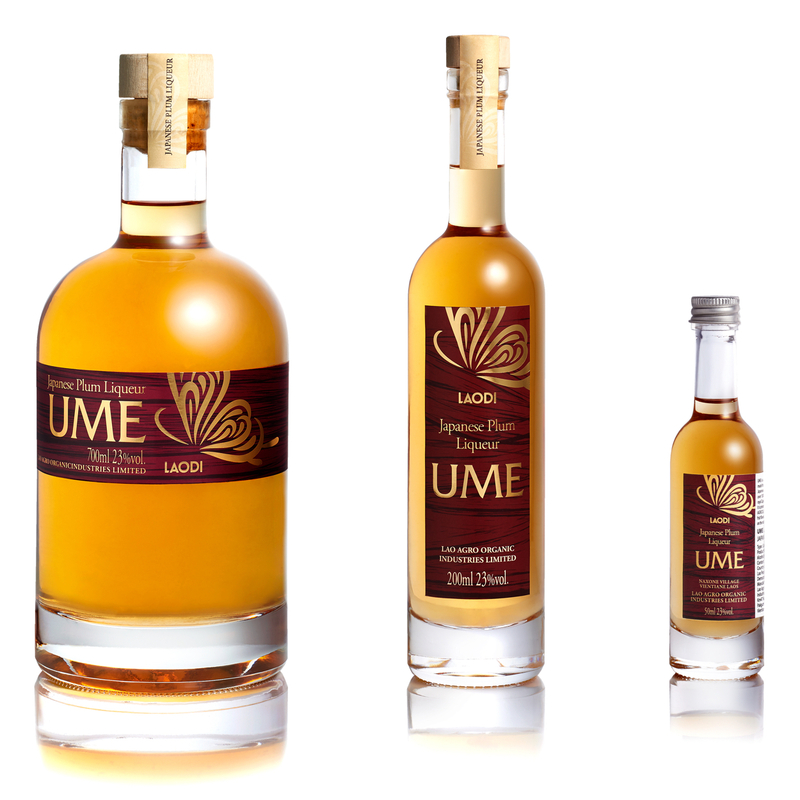 The exquisite aroma and taste of UME Marriage Rum is a one off experience but hopefully one you will be able to repeat and enjoy many times! Japanese traditional plum wine is produced with LAODI white rum and Japanese plum; Ume. On the rock, mixed with soda or straight recommended. LAO AGRO ORGANIC INDUSTRIES LIMITED. All rights reserved.